Set an intention, make an appointment, pledge a promise, cross your heart. life isn’t always a respecter of such things…and really, why should it be? Life is bigger (& thankfully, more mysterious) than that. this is what I would have brought. Wash the spinach, removing only the thick long stems if there are any. Drain excess moisture from the leaves. In the largest wok or sauté pan you have, add the olive oil. Turn heat to medium. When oil begins to shimmer warm, drop in the chopped garlic and ground coriander. Stir until the aromas rise. Without adding any additional water, pack in the spinach leaves, place a lid on the pan and reduce temperature to low. The water remaining on the spinach will gently steam it and will prevent the garlic from scorching. The garlic and coriander will infuse the steam with their flavored scent and the spinach will bask in it. 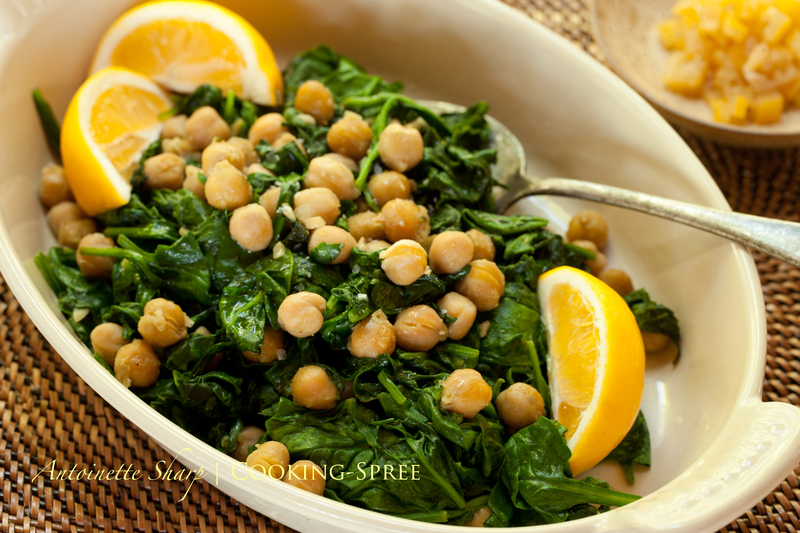 When the spinach has wilted, add the drained chickpeas, a good dash of sea salt and pepper. Cook for a few more minutes, turning occasionally to incorporate and warm the chickpeas. So easy, right? Now serve, drizzled with a bit more olive oil & lemon wedges, ripe for squeezing. And if you have any, do serve with chopped preserved lemons. It’s insanely delicious. To print a copy, click here. This recipe varies very little from one I first found in Claudia Roden’s New Book of Middle Eastern Food, one of my favorite cookbooks. 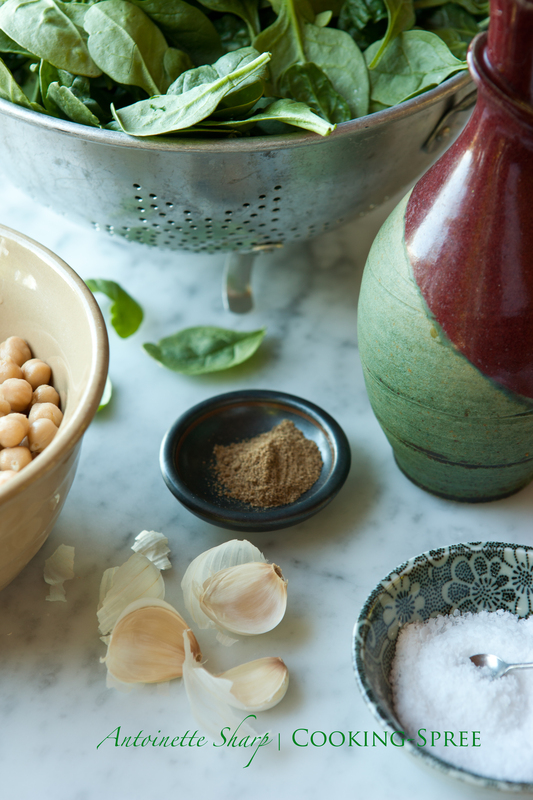 Looks both tasty and satisfying–I love chickpeas whether so identified or termed garbanzo or ceci beans. The only modification I might make is to add some toasted sesame seeds to this salad–spinach and sesame is a typical Japanese dish and I think the sesame would go well with the garbanzos. 🙂 Yes, no rush for winter! But fall might feel nice about now for you! I do have to say, you’ll be so happy you made these lemons John. They can so knock the socks off a ho-hum dish (not that ho-hum is ever going on in the Bartollini kitchen – I know better!) Still, I know you’ll really like them! An intriguing sounding recipe. I’ll try it soon. Thanks Ronnie! So sorry it took me so long to respond. I’ve been to the moon and back. 🙂 Hope you’re enjoying summer in Pa! Sawsan, I apologize for waiting so long to respond! I so get why spinach could turn up its share of noses. Do you like chard or kale? Spinach is milder, sweeter. Baby spinach, tender, needs very little (if any) cooking and pairs so well with so many different ingredients. To my mind it’s one of the most versatile of all green vegetables and will basically do what you ask it to. 🙂 I seem to remember you liked preserved lemons so this may indeed be a good place to start. I hope you’ll let me know if you try it. Yum! And that photo of the ingredients on the marble slab — so lovely. Though I love spinach and lemon, I never would have considered this combination with the garbanzos. You challenge me in all the best of ways. Very good recipe, which is going on the list for making. It’s a long list, but that’s all right. Oh I needed this yesterday! And I had all the ingredients at home too! Never mind. Looks great. next time I need a mad dash dinner on the run will look this one up. Thanks. But for now off to pack. Heading to a sunny Chicago in the morning… from a cold and dreary Melbourne, Australia. It’s taken me an awfully long time to respond to you…excuse me for that…by now you may be back from (baking in) Chicago and be grateful for a chill in Melbourne. Thanks for your comment…hope you enjoyed the trip!! I have that book too Spree wonderful writer . I adore the 3rd image I could look at it for ages so well balanced in form and colour and interest. Super! Yes, great book! And a very kind comment. Thanks Lesley! I’m at last getting back from a long absence. So anxious to see where your camera has taken you! Wednesday, Thursdays or even Sundays and all days of the week that are ready for a bright and brilliant vegetable like this one. I know for sure i would have liked it as I often make something similar. But now you´ve introduced the wildly delicious preserved lemons to the mix and it has been elevated to “wooo hoooo”!! Yes three cheers (and then some) for the preserved lemons! We’ll forgive you, since it looks so yummy :D. I had some lovely vegetables on Wednesday – I’m on a health kick. I even went to circuit training! 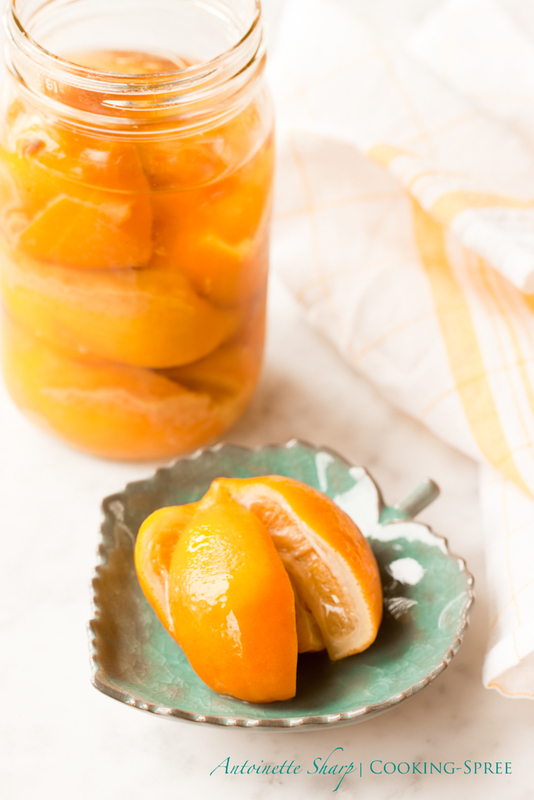 Will make and eat very soon…I LOVE preserved lemons and should try making some on my own. I do like Stonewall Kitchen’s preserved meyer lemon but it’s a bit pricey. Lovely and simple, Spree and luckily I have all the ingredients! I’m a bit confused though, because I am reading this on a Friday, is it ‘friday’s wednesday vegetables thursday’ or ‘wednesday vegetables thursday’s friday’? Oh Val! And now it’s an entirely new month! And I’ve completely lost my way so will have to start fresh this coming Wednesday. Living by a calendar can be SUCH a burden! 🙂 How’s the allotment? I’ve missed keeping up!!! Hi Spree! The allotment is a bit hit and miss this year with all the rain and the hordes of slugs. But enough good stuff is happening to keep me interested. My rhubarb made a bad start but is doing great now, so lots of jam making next year! I have been eating my own spinach, garlic, shallots, spuds, onions and strawberries. Coming along are broad beans, beetroot, carrots, parsnips, peas, red onions, broccoli and cabbages. And I am hopeful for courgettes, fennel, french beans and turnips. I can’t really complain, can I? I’m going to make this right this minute! My mouth is watering reading this!!! Such delicious, simple, wholesome comfort food!! We had a similar recipe that we used to make all the time. Thanks for the reminder. Looks great. Here’s the thing: 2.0 hate chickpeas. But I love ’em. And 2.0 is going away this week. I bet you know where this is going… Bring on the spinach and chickpeas!! I just love love love chickpeas! I’ve always wanted to preserve lemons. Did you preserve your own? What other recipes do you use them in? They would have to make an awesome vinaigrette. 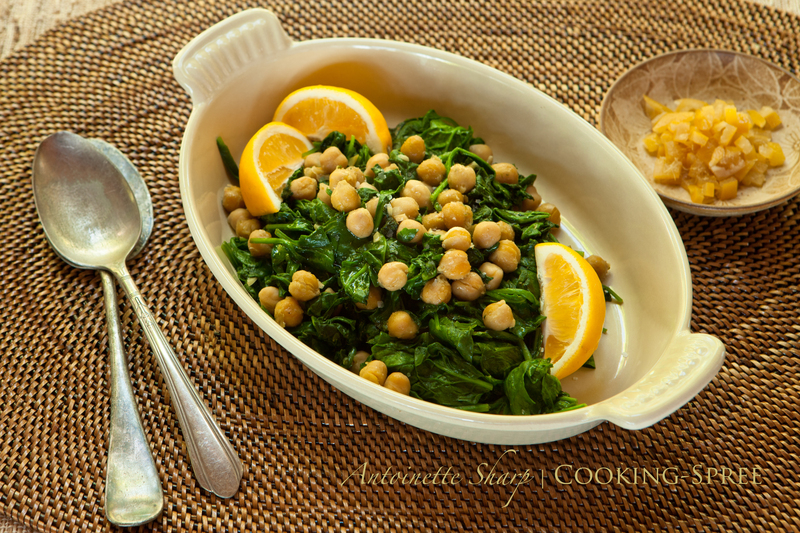 Spinach and chickpea is a marriage made in heaven! looks like perfection!! thanks for sharing!